With the development in global economic and transportation engineering, the traffic loads on brides have been growing steadily, which become potential safety hazards for existing bridges. In particular, long-span suspension bridges support heavy traffic volumes and simultaneous truck loads on the bridge deck, and thus the safety and serviceability of the bridge deserves investigation. 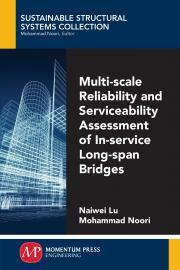 In this book, a multiscale reliability method is presented for the safety assessment of long-span bridges. The multiscale failure condition of stiffness girders is the first-passage criteria for the large-scale model and the fatigue damage criteria for the small-scale model. It is the objective of this book to provide a more in-depth understanding of the vehicle-bridge interaction from the random vibration perspective. This book is suitable for adoption as a text book or a reference book in an advanced structural reliability analysis course. Furthermore, this book also provides a theoretical foundation for better understanding of the safety assessment, operation management, maintenance and reinforcement for long-span bridges and motivates further research and development for more advanced reliability and serviceability assessment techniques for long-span bridges. Naiwei Lu is a lecturer of civil engineering at Changsha University of Science and Technology.